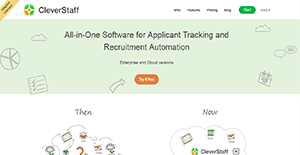 CleverStaff is a comprehensive applicant tracking and recruitment automation software. It is a single platform for all the necessary tools recruiters require in looking for qualified talents, keeping track of vacant positions, and organizing pertinent data. With CleverStaff, HR teams can focus more on assessing candidates rather than on tedious administrative tasks. That is because the software automates various aspects of the recruiting pipeline as well as other actions such as pulling up reports and resume parsing. Furthermore, CleverStaff connects recruiters with more candidates via its connections to LinkedIn and local job boards. This enables them to expand their search for top talents and fill vacancies at the soonest possible time. With CleverStaff, organizations’ HR departments can keep their records organized in one place. Users are able to save potential candidates directly from LinkedIn, email files, and local job boards because of the application’s 1-click integration capability. On top of that, CleverStaff also enables its users to export data from Excel files and to migrate the database from a previous applicant tracking system swiftly. This way, the HR team can focus on the important recruiting aspects rather than on administrative tasks. CleverStaff provides HR teams with robust recruiting tools. From the program’s interface, they can instantly search for likely job candidates on LinkedIn and local job boards. Furthermore, CleverStaff’s email integration enables users to send email communications to applicants, clients, team members, and other stakeholders without switching to another software. Moreover, recruiters can synchronize their interview schedules and related tasks with Google Calendar as well as Outlook. These functions allow the reduction of time spent between different interfaces just to perform similar or related tasks. CleverStaff paves the way for a more efficient workflow. The application lets users automate tasks such as reporting and even enables the automation of certain functions in the recruiting pipeline. These features and more allow the HR team to delegate most of their energies on finding and acquiring the best talents for their companies. Because of its data structuring capability, CleverStaff makes it painless and effortless for people to find the information they need. From candidate history, open positions, interview schedules and logs, and more, the application affords users the ability to instantly search and pull up the data they require. If you are considering CleverStaff it may also be a good idea to analyze other subcategories of Best Applicant Tracking Software gathered in our database of SaaS software reviews. Every enterprise has its own characteristics, and may call for a specific Applicant Tracking Software solution that will be adjusted to their business size, type of clients and staff and even particular niche they cater to. We advise you don't count on locating an ideal solution that is going to work for each business no matter what their background is. It may be a good idea to read a few CleverStaff reviews first and even then you should remember what the service is supposed to do for your business and your staff. Do you require an easy and straightforward app with just essential functions? Will you actually use the complex functionalities required by pros and large enterprises? Are there any particular tools that are especially useful for the industry you work in? If you ask yourself these questions it will be much easier to find a solid solution that will fit your budget. How Much Does CleverStaff Cost? We realize that when you make a decision to buy Applicant Tracking Software it’s important not only to see how experts evaluate it in their reviews, but also to find out if the real people and companies that buy it are actually satisfied with the product. That’s why we’ve created our behavior-based Customer Satisfaction Algorithm™ that gathers customer reviews, comments and CleverStaff reviews across a wide range of social media sites. The data is then presented in an easy to digest form showing how many people had positive and negative experience with CleverStaff. With that information at hand you should be equipped to make an informed buying decision that you won’t regret. What are CleverStaff pricing details? What integrations are available for CleverStaff? If you need more information about CleverStaff or you simply have a question let us know what you need and we’ll forward your request directly to the vendor.